Change in technology- Nobody can ignore the change that has taken place ever since smartphones entered our lives. Mobile device and their corresponding applications have infiltrated every sector and enterprises are no such exceptions. Companies have realized the fruitfulness of using such applications to cater their in-house business operations due to their portability and multitasking capabilities. Stressing on the importance of BYOD- The advent of mobile technology, in turn, have prompted the new concept of BYOD or bring your own device to their workplace that came as a blessing to the existing employees. ‘Work from home’, is also made possible courtesy BYOD rendering more work flexibility to the professionals as they can work from either office or any other preferred location. The business organization is a complex framework that homes employees with varied preferences in terms of devices that they use to conduct their task. Few make use of Android handsets wherein few others prefer iOS phones and there are others who stick to laptops or desktops. Designing applications to cater the myriad requirements can be quite a humongous task to accomplish. The proper functioning of an enterprise mobile application development service depends largely on the efficiency of a dedicated mobile application developer hired by the organization. 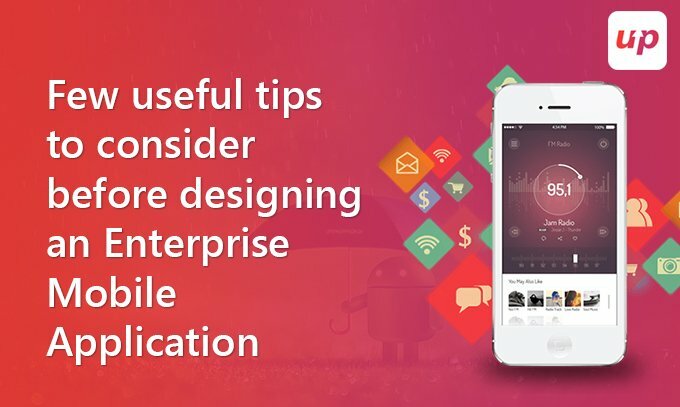 Even before designing the prototype, there are few factors or useful tips that need proper consideration before emerging into the enterprise mobile app development process. Initiate with target application user research- Nothing beats a proper development process than a poor research. Conducting research on the target customers is imperative before embarking on the whole app development process to obtain a clear insight into their specifications, tastes, preferences, the type of device and OS that they use and their expectations from the application. Useful feedbacks can clear out the confusion and set the developer on the right track to the development process. Customized apps according to the user’s needs- Even before zeroing down to the application process it is advisable to identify the reasons why your company plan on coming up with an application and jot down the core areas where such an application can benefit the company. Availing the service of an enterprise app development company since building an app leads to further expenditure. Hence customizing application is best advisable to cater all your needs pertaining to the smooth functioning of business operation. Considering the importance of integrations- Functioning of back office via APIs must be integrated right from the beginning of the development process if it is affected by the backend functions such that every step of the process right from integration to security and authentication work smoothly. Leverage the features of existing devices- There are many native functionalities unique to a particular device which any experienced mobile application developer must have the knowledge and expertise to leverage the useful device features such as cameras to GPS to the advantage of the enterprise application considering how and in which context the users are going to utilize it. Prioritizing user experience- The enterprise mobile application is built to simplify the workload of the company’s workforce and hence understanding their preferences holds the very key to acquire application success since enterprise mobile applications aim in offering optimal solutions to their in-house problems. The features stuffed up within the app framework generating a seamless user experience is what matters in an enterprise application. Focus on functions and performances- It goes without any doubt that visual impression goes a long way in fetching users but enterprise mobile applications are designed for a completely different purpose where UX is given more importance than UI. Hence focus must be on responsive features and performances more in addition to the aesthetic values. Avoid copy-paste technique- Usually; companies hire a professional mobile application development company to confer the entire task of building and maintaining the enterprise application that mostly follows similar kind of features. Make sure your hired developer does not simply copy paste the standard features rather prefer to come up with a unique concept for the application. Consider security issues for enterprise apps- Enterprise application developers need to exert more importance in observing stringent security policies within the application which is required to store and share confidential enterprise data among the team of professionals. Make sure not leave any loopholes for smart hackers to exploit even though the concept of BYOD has often raised questions over security and another issue is the public Wi-Fi which has emerged as the hub for smart hackers lurking to steal any crucial data. Enterprise mobile application upholds the basic concept on which the rest of the applications are designed but they differ in the complexity of UI/UX to support the different devices and the operating system used by the employees and or the users for whom the application is designed. Instead of hiring either a separate iOS app developer or an Android mobile app development company, it is advisable to avail the service of a developer who holds the experience in designing cross-platform mobile applications. Fluper, one of the top-rated mobile app development companies, have proved competency in designing applications for multi-platforms. Next articleAre Micro-Apps the future of the present Mobile Applications? ?